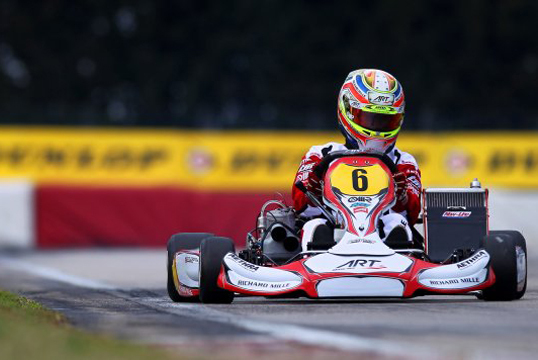 ART Grand Prix outperforms the competition at WSK opener The opening round of the WSK Champions Cup held in La Conca, Italy, saw Ben Hanley outshining his rivals in KZ2 final. Following the promising 4th place at the Winter Cup the previous weekend, experienced driver Ben Hanley was in for revenge at the opening round of the WSK Champions Cup in KZ2. The British driver soon showed all his speed by claiming a 4th in the first heat after stopping 8th fastest time in qualifying, and 2nd in Heat 2 also stopping the fastest lap of the race. Too bad that the third and final heat saw Hanley involved in a race accident on lap 3 while fighting for position in the top 3 and ending on the sidelines a few laps later. With a P8 on prefinal starting grid, the Brit knew he had to do his best to have a shot at the podium in the final, and his race conduct was a masterpiece of driving. Keeping close with the leading group for two thirds of the race, the Brit waited the closing stages to move up to 4th with 4 to go, and to 3rd on a last lap dash. The final was just as remarkable, with Hanley taking advantage of his superior performance to move up to 2nd by half race distance, and to the lead with 4 laps to go. Hanley’s unmatchable speed allowed him to fend off his closest rival attacks and grab a brilliant win as well as the championship lead. Teammate Mirko Torsellini had a rather difficult heat session, but a more effective set up saw him moving up to 8th in prefinal from 20th on starting grid, then closing the final in 10th, worth valuable points in the championship. In KF, Sergio Sette Camara and Takuya Okada went through the double prefinal stages after fighting hard in the heats. After starting the final from the back of the field, the Brazilian was involved in an accident while trying to move up the order, and the Japanese driver battled incessantly showing a consistent performance. Despite few penalties in the heat sessions, the Junior drivers put up an exciting show also clinching some top 10 positions in the heats with Finn Patrick Pasma and Brit Josh Smith. Qualifying still proved particularly tough for the young guns of the team managed by Armando Filini, as well as the double prefinal system, which saw only Yifei Ye from China making it through to the final, as Smith was out right after the start following a huge pile-up. The Chinese driver was protagonist of an outstanding performance in the prefinal where he managed to make up as many as 18th position to close in 5th following a superb start. In the final, Ye saw his luck reversed following a disastrous first lap which saw him dropping from 10th down to 28th. Forced to race the entire final in comeback mode, the Chinese was only able to close in 26th.